The 4 seater Jigsaw bench is ideal for use in a wide range of locations such as schools, nurseries, leisure centres and playgrounds. The Jigsaw bench is manufactured from recyclable polyethylene making it suitable for indoor and outdoor use. Polyethylene is a very tough and durable material meaning the bench can be located outside with very little maintenance required. 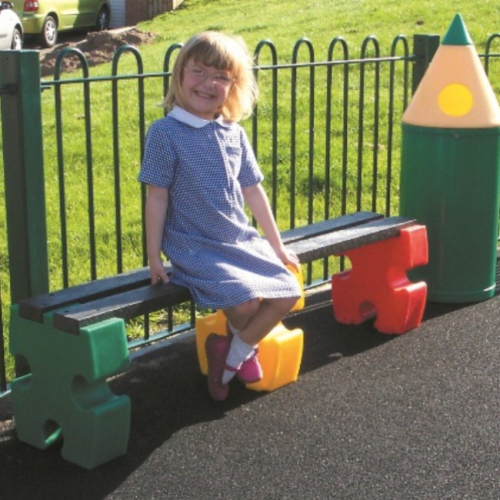 The Star Bench is also UV stabilised and will never stain, rust or corrode. The black seating slats are available in black only and are manufactured from 100% recycled material. Each bench is supplied with ground fixing bolts which are ideal for fixing the bench to hard surfaces. If you intend to locate the bench on grass, the optional earth fixing kit would be required.